Chiefs running back Jamaal Charles accumulated nearly 2,000 all-purpose yards in 2013. The Chiefs are without their most productive offensive weapon for the remainder of Saturday’s Wild Card matchup against the Colts at Lucas Oil Stadium. 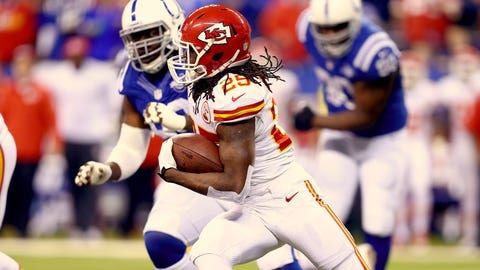 During Kansas City’s opening possession Saturday, All-Pro running back Jamaal Charles was given a baseline concussion exam on the sideline moments after a freak incident where he hit his head on the turf while being tackled. Charles was taken into the locker room for further examination and was replaced by rookie running back Knile Davis. The Chiefs later announced Charles was out for the remainder of the game with a concussion. Davis, who finished the game with 18 carries for 67 yards and 2 touchdowns, also left the game early with a knee injury. The league’s third-leading rusher is also a factor in Andy Reid’s passing game. Charles, 27, finished the regular season with 1,980 all-purpose yards and scored 19 total touchdowns in the regular season. Wide receiver Donnie Avery was, also, ruled out with a concussion in the third quarter.